Desert Ridge is located North of Tatum and the 101 Freeway, and is home to many Phoenix residents that have to bare the heat of the summer. Homes in the Desert Ridge area range from 1500 to 6000 square feet and average about 25 windows per residence. 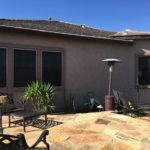 With the windows being the primary source of heat gain on a typical house, it is very common for residents to install sunscreens on their Desert Ridge home. The homes in Desert Ridge often have similar colors to one another, and the window screen colors are in most cases chosen based off the aesthetic match of the home. Since the homes in the Desert Ridge area have more of an earthy tone, the most common sun screen fabric color is brown. This matches nicely with the tan colors that most of the houses in the Desert Ridge area have. In addition to the sun blocking screen fabric, the window screen frame must match as well. The majority of the window frames in the Desert Ridge area are what the sunscreen industry calls Champagne or Adobe. Therefore, it only makes sense that the sunscreens in Desert Ridge also get installed with a champagne or adobe colored sun screen frame. Due to the standard installation methods of sunscreens with barrel clips, it is best to stick with the same sunscreen covering frame color as the factory window frames. 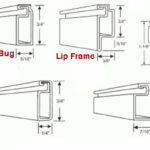 If you do not use the same window sun screen frame color as the factory window frame with the industry standard installation with barrel clips, then there will be a section of the window frame around the outside of the installed window sunscreen frame that shows through as such color, and in most cases will not be appealing. Another aspect of window sunscreens installations in the Desert Ridge area besides the sunscreen frame, is the amount of protection to use. This of course meaning the percent of sun protection the sunscreen fabric choice offers. In most cases, the options are for an eighty or ninety percent solar sun screen fabric. In the Desert Ridge area, there are many beautiful green-belts and natural desert landscapes that offer a wonderful view for the many two story homes. This is often important when considering the eighty or ninety percent window screen fabric on your Desert Ridge home. Obviously the installation of sun screens are to do just that… Screen the sun. But the outward visibility should be considered as well, especially when there are views involved. The ninety percent window covering sun screen fabric offers very good sun protection, however the eighty percent sunscreen fabric offers only ten percent less sun protection while maintaining a surprisingly excellent view and outward visibility. These are some of the very important window sun screen decisions to make when installing sunscreens on your home in Desert Ridge.